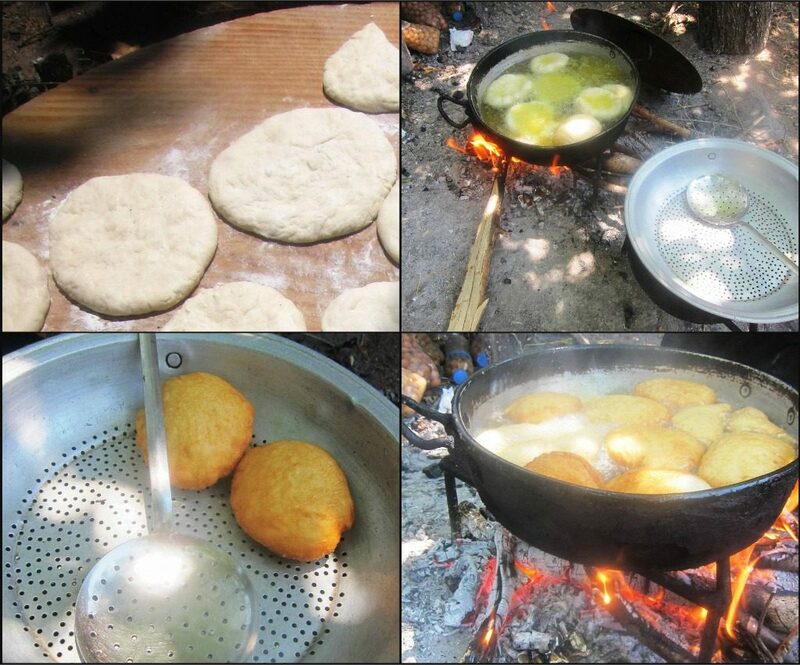 End of Ramazan in sight: Leyla makes traditional pişi in the garden! Komşu! Un var’mı? Neighbour! Do you have any flour? An early morning call over the garden wall. It was my neighbour Leyla here in our Aegean village of Assos: have you got any flour, she was asking. Then she said ‘I’m making pişi for bayram. Would you like to come over to watch?’ She knows I am always interested in village food and customs. The bayram or official holiday starts on Friday following this holy month of Ramazan in which devout Moslems fast from sunrise to sunset. Leyla was making hers a day early in anticipation of the hordes of tourists who will undoubtedly descend upon the village for the holiday: she will be manning her sergi or stall where she sells local tablecloths, olive oil, bay leaves, apples, kekik or dried thyme and the like. I am so glad she hasn’t succumbed to the temptation to sell cheap Made in China souvenirs like many of the other village stalls. Pişi are for bayrams or special days and are eaten for breakfast with white cheese and the usual breakfast items like olives, tomatoes and cucumbers. Leyla will give some to her neighbours especially the elderly and those who don’t make their own. She also pressed a couple on me! Well, I suppose I am a neighbour! There I spied Leyla under a mulberry tree in her garden with a huge pan of hot olive oil balanced over a fire beside her. She had already made at least 4 tepsi/trays of pişi – little rounds of dough made from flour and water with a little salt and yeast and each tray was covered with cloth. 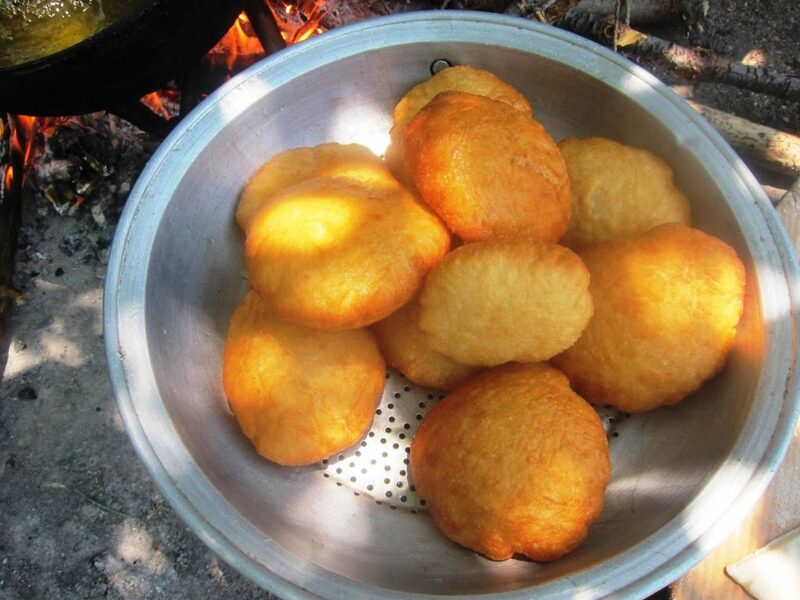 She had reached the frying stage: a round board was first liberally floured and then each little mound of dough was flattened, turned over and pummelled again before being dropped into the oil. A few minutes on each side was enough to ensure each round puffed up and turned a beautiful golden brown. Then with a large slotted ladle, Leyla scooped each one up and into the waiting metal colander. Surprisingly, the pişi were not in the slightest bit greasy: in fact, they looked very appetising! Pişi must surely be at their best while warm … with strawberry or plum jam and white cheese .. mmm. Eline sağlık, Leyla! Health to your hands! Previous Post: « Roasted Summer Vegetables and a Birthday BBQ in Assos!